There is a lot of good media that has the word Strange in the title. Stranger Things, Life is Strange, Doctor Strange and even the song Strange Times by The Black Keys come to mind. You can add Strange Brigade to the list. They hit every nail on the head when building this title. A supernatural shooter set in the 1930s, you’ll get the positive vibes that came from other games with similar gunplay. Resident Evil 5, Tomb Raider, and Uncharted all seem to have been mixed into a pot. There’s a cluster of things to do: besides the campaign you can do Horde and Time Attack modes. 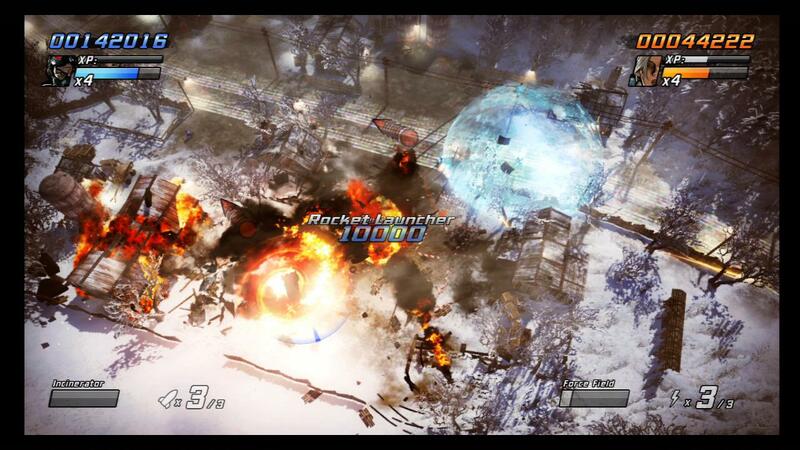 With up to four player online co-op, you are delivered one of the best shooters of the year. Action-Packed – Are you ready for dangerous exploration and treasure-stealing? Guns, loot, and puzzles aplenty are here. It’s like Indiana Jones on steroids. You will be destroying mummies, giant scorpions, skeletons, and plenty of other undead beings. Pure enjoyment comes as you devastate your enemies, putting them back into the graves they left. Being low on health changes your screen into black and white, and you can hear a slow beating heart as you near a heroic death. The environment is your playground with deadly traps and exploding barrels. As you’re surrounded you must quickly roll out of the way, sometimes barely avoiding injury. The fury and timing of setting off traps without being caught within them is exhilarating. This is what shooters are all about and Strange Brigade hands you the keys to the ride. There is a story that is interesting and, through reading the diaries and biographies, you may find yourself content with it. Nothing mind-blowing, but it doesn’t need to be. We’re here to blow stuff up. One last charge into the jaws of almost certain death! Narration – If you’ve ever been to an amusement park, like Disney or Universal, you know a lot of the experience comes from the over-dramatization of your ride. While waiting in line you’re treated to some backstory and it really wraps you into the world of the attraction. The narrator gives you this feeling, melding action into a fun and almost comical adventure. Like that, the writing here has some serious wit and intelligence behind it. An outstanding job was done and it might be one of the best narrations you will hear, period. There are plenty of one-liners that you will enjoy hearing multiple times. My favorite quotes are based on the cat statues. “I had a cat once…ONCE!” is delivered so well you might find yourself laughing. The comments on incoming peril, beckoning you to continue forward without fear, are awe-inspiring. The excitement is contagious and is just as supernatural as the events taking place. Puzzles and Collectibles – Besides the violence, you will be collecting gold and artifacts that let you unlock more amulet powers. The puzzles are not too challenging but some require thought. After battling sinister sorcery-filled areas, it’s a nice breather to relax with a puzzle. If you’re a fan of collecting, this game is a must. Each level has various items to collect and shoot, meaning you will want to replay the levels over and over trying to find what you had missed. The only way to get skill points to buy amulets is through collecting the artifacts. Diaries allow for some more reading for lore. Even shooting the cat statues result in opening a room that grants you lots of gold. This gives the game a ton of replayability if you’re a completionist. 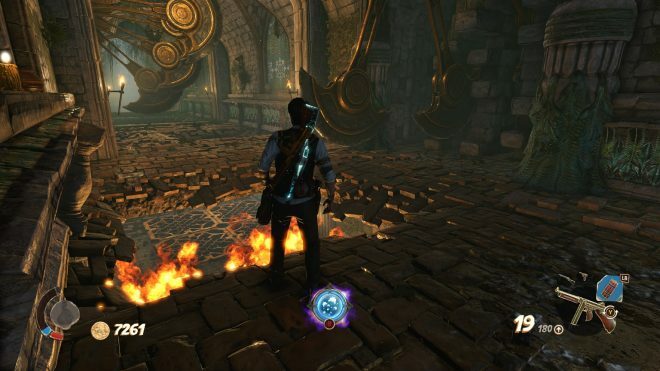 Some collectibles will have you navigating treacherous traps and imposing obstacles. 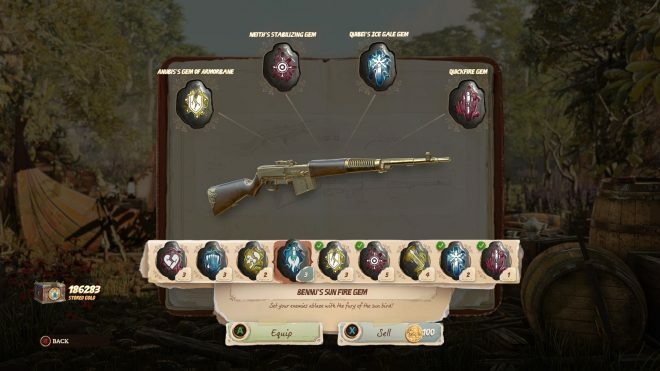 Elements and Special Weapons – To keep things interesting, you can upgrade your weapons with various buffs and elements. Freezing an enemy or setting them on fire adds glee to your vanquishing. I’m always a sucker for these types of effects. Ever since Pokémon and Chrono Cross I fell in love with choosing what color of madness I wanted. With all that loot you’ve been gathering you can purchase special weapons from boxes. This is a must in horde mode but is still quite helpful in the campaign. These overpowered weapons usually have some type of element attached to them as well. The coolest one I found has electric bullets that paralyze the enemy in place. Crazy Rich Brigade – Gold only allows you to purchase new weapons and gear. Once you have bought everything, it just builds up and seems to be a second thought. You don’t care to grab gold anymore afterward. It would be nice to be able to obtain gems or boosts for when you play horde. The addition of gun skins or character costumes would have been such a great feature. Currency just becomes meaningless. To add insult to injury, you can sell your sought-after gems that are used for upgrading weapons. You get a measly 100 gold for it. Kill a few enemies and you get that, so I wonder what’s the point in selling them? The narrator does explain that saving the world costs money, but now that it’s saved, what can we spend it on? Problems in Co-Op – The entire campaign and various modes can be done with friends or random matchmaking. 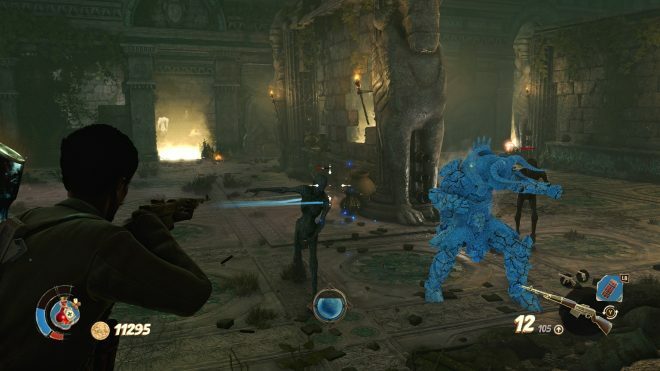 Within multiplayer, there will be more enemies that have even more health. The puzzles even increase in difficulty requiring everyone to work together in order to solve them. Gold is not shared amongst your peers, meaning there will be some randoms from matchmaking that take it all. Buy a special gun from a chest and someone else can come snag it without your permission. The downfall with playing with friends is actually the lag that comes with it. This makes timing a bit rough, especially when using melee attacks. You’ll knock an enemy down, which seemed like luck to begin with, then fail several times trying to use the stomp finisher. The Horde mode is a great addition to the game but just seems endless. It takes a very long time to finish all 15 waves in a round. You’ll need a lot of time on your hands when you play this, without the satisfaction you feel for completing it. Browse games is a fantastic feature, letting you join anything in progress and even allows filtering of certain levels. I’m fine with how multiplayer was designed and implemented, but the lag is an issue that keeps it from succeeding. Characters Don’t Really Matter – When given the option of whom to pick, you really can’t go wrong with any choice. Even with the details in character selection showing different strengths, they go pretty much unnoticed while fending off the undead. Could one of them have been a healer? Everyone can be the same character online if they wanted, so there is a definite cry for some type of class-based system. Of course, there are the amulet abilities which is what you may decide to base your choice on. I think Frank is the best choice, having the most health and the ability to raise an undead army that distracts the enemy. Other than that, some of the amulet powers are mediocre feeling. Some don’t even connect right and you’re only killing one enemy! Some sound destructive, like tethering an enemy and laying waste to all enemies who cross the path. It lasts for mere seconds and you find yourself rolling around like an idiot trying to get a few kills. There are only a few usable powers out of the 16 available, which is disappointing. A thrilling adventure game that is sure to please, Strange Brigade does almost everything right. There were too many things I liked about the game to mention (graphics and sound are also top notch). This isn’t Rebellion’s first third-person shooter, and the growth of quality has increased with maturity. The Egyptian theme is everywhere, from the menu system to the excellent narration. It’s as if you were playing an action movie, with the brigade seeming to have their own personal agendas that happen to coincide with saving the world. After the credits roll, you’re more than likely going to go back to the menu and continue playing. 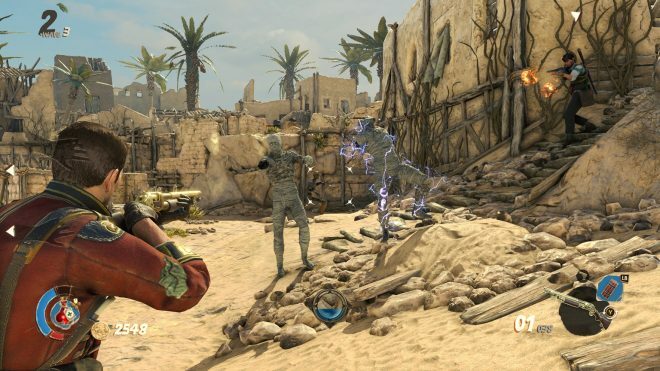 Strange Brigade was developed and published by Rebellion on Xbox One. It was released on August 28, 2018, for $49.99. A copy was provided by the publisher for review purposes.